On Friday, three elderly people from Southern California brought a hackneyed sitcom scenario to life when they unwittingly downed pot brownies at a friend's memorial. 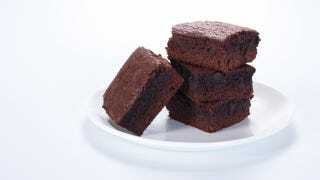 During the service someone passed around a tray of brownies, but didn't tell anyone they contained medical marijuana. Sadly, the ensuing hijinks don't sound all that hilarious: Three seniors in their 70s and 80s were admitted to the hospital with nausea, dizziness, and the inability to stand unassisted.